Cheesecakelets immediately transport me back to my very first studio apartment. Atop the tiny stovetop, I’d whip up batch after batch of these tasty pancakes in Ikea’s cheapest finest skillet set. Made with just a smidgen of oat flour ground in my trusty Oster blender, they marked my first successful foray into gluten-free cooking. Back then, I was just beginning to explore gluten-free cooking and didn’t really know where to start when stocking a pantry. Rice flour (which I’ve never really enjoyed texture-wise), gluten-free oats and cornstarch were pretty much all she wrote. What attracted me to this recipe from Nigella in the first place was that very little flour was needed; the bulk of the batter is made up of egg yolks, whipped egg whites, sugar and — trust me on this one — cottage cheese. In place of ground oats, I now reach for my trusty millet flour — anything to save on dishes, amiright? The pancakes turn out irresistibly fluffy, dotted with pockets of melty, sweet curds every single time. 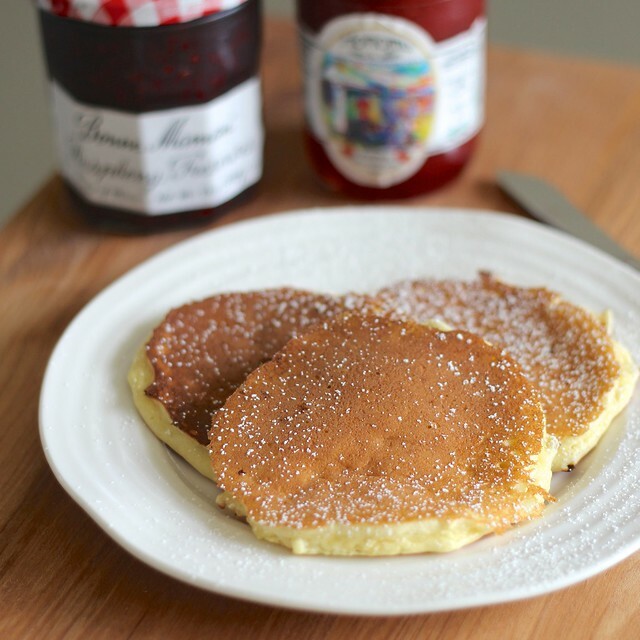 Dare I say they’re even better than classic buttermilk or almond pancakes? That might be the nostalgia talking. 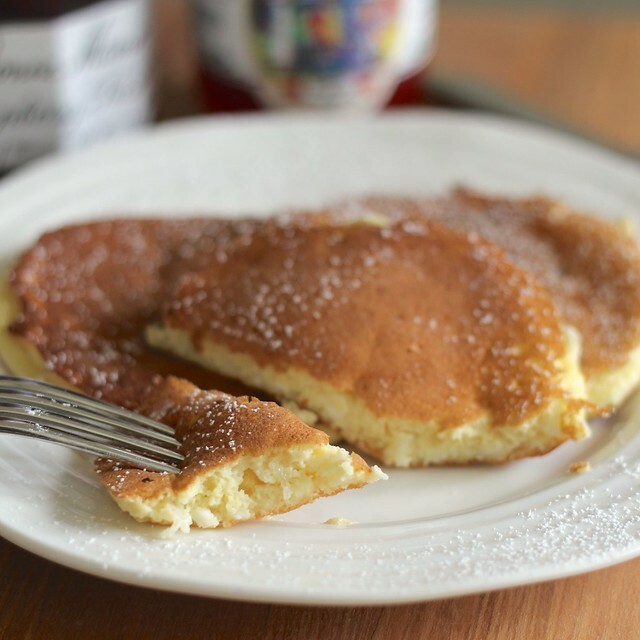 Share your favorite gluten-free pancake recipe — links welcome! — in the comments or on Facebook or Twitter! Just like sour cream, I prefer my cottage cheese free of added gums and stabilizers — a simple ingredients list of cultured skim milk, cream and salt is where it’s at. Daisy Brand is my go-to. However, the cheesecakelets do turn out a-ok with just about any small curd cottage cheese, even the super low in fat stuff. Set a nonstick griddle over medium heat. Combine egg yolks and sugar in a small bowl (2-quart); whisk for about 1 minute or until well-combined. Whisk in vanilla extract. Add millet flour and baking powder, and whisk until batter is lump-free. Using a spoon or rubber scraper, gently stir in cottage cheese until evenly distributed. Place egg whites in the bowl of a stand mixer fitted with the whisk attachment; beat until stiff, shiny peaks form. (Alternatively, you may whip egg whites by hand with a clean balloon whisk or with the aid of a hand mixer.) Fold egg whites into egg yolk mixture. Once griddle is hot, grease with a small amount of butter, wipe away excess with a paper towel. Scoop about 1/4 cup batter onto the pan for each pancake — they’ll spread out a bit, so be sure to leave enough room between them! Cook for 3 – 4 minutes on each side, or until golden brown. Serve hot with desired accompaniments! Love this idea, and the name! Any way to eat “cheesecake” for breakfast sounds good to me. Personally, I do tend to buy the gross gum- and stabilizer-filled nonfat cottage cheese, but I always feel a bit squicked out about it. Thanks, Molly! If Cowgirl Creamery hadn’t ruined me with their creme fraiche-enriched cottage cheese (sadly it’s no longer in production) I’d be right there with you! Clearly I’m a bit motivated by nostalgia :).